One of my favorite authors on the martial arts is Donn Draeger. I find his material to contain a wealth of information and has been a reliable source for a number of my articles. As a career military man, Draeger spent decades studying and teaching the martial arts in the US and abroad. Most of his formative training was done in Japan. One of Draeger's themes that were repeated throughout his discourses was the development of the trainee. Now bear in mind that for Draeger, budo - the Japanese martial ways, were more like spiritual disciplines than systems of combat. He must have realized that getting the typical Western reader to really understand where he was coming from may have been difficult, as the bulk of his writings were done at a time when martial arts were fairly new in the West. Fudoshin and ki weren't exactly household terms in the sixties, so Draeger would deftly fall back on the power of metaphor to get some of his points across. Here, in Classical Budo, he uses the analogy of a typist to explain the mindset of the burgeoning student and the beginnings of martial mastery. After sufficient experience in typing, the typist becomes a master touch-typist. He no longer needs to depend upon the mechanics of how to type, nor has to rely on memory to find the positions of the keys. He makes few errors if any, and has the speed and accuracy that give his typing the mark of the master. He knows typing, can type, and knows he can type: he is a master typist. Though he is a master he readily fails one test that a less trained typist can manage with ease. This is the keyboard recall test. The master cannot quickly recite the keyboard from memory, for he has forgotten the locations of the letters. But in spite of his "forgetting" we cannot truthfully say he cannot type, nor that he is not a master typist. So "forgetting" in this sense means that we no longer have to rely on ordinary conscious thinking. This is the desired end-product of training. You simply do it and that's it. But that's not the same as being forgetful. Once I was showing a new student a basic form, one that I've done a thousand times. About midway through I was completely lost. Teaching is not the same as doing, as I found out, and it was this new perspective that threw me. There's a story about the mystical Morihei Ueshiba. 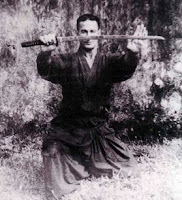 One day after finishing a particularly arduous training session, the master was out in his garden meditating when suddenly there was a flash of light, the ground began to shake, and he forgot every martial arts technique he ever learned. And thus, Aikido was born. Both Ueshiba and Draeger emphasized that through dedicated training, one forgoes or forgets the self - the ego, in order to become one with their art. This is the way to technical mastery. Draeger's three volume Martial Arts and Ways of Japan are a must read. Very enjoyable read John.I work in a community of visual artists. There are some that are very masterful in their craft. There work is both full of tradition and yet very fresh. Creating a painting is just like breathing. They make it appear effortless. You can see by their technique who their teacher was, though you would never mistake a "Lueck" for a "Shapiro". When complimented they sincerely reply, "Oh that? No big deal" and mean it. I sure you have heard the phrase "He has forgotten more than I will ever know". Directness... economy of means...so many similarities between the arts. Creating a painting is just like breathing. They make it appear effortless.I suppose for the master painter his creation really is effortless. Of course it takes some time and effort to get to that point. Here's an article you should enjoy that discusses martial arts specifically as an art form. I hadn't heard that analogy from draeger before, that's great stuff.